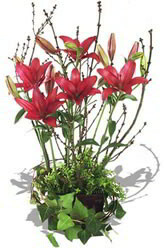 This charmingly wistful arrangement displays red Asiatic Lilies seemingly bursting to life out of a dense undergrowth. It accents autumn perfectly with an elegant combination of lush greens and vivid reds while drawing the eye like firefly trails along curved budding blossom sprays.Lilies may be sent closed/partially closed in order to prevent damage and to last longer.To better personalise your gift, we recommend you purchase a bottle of Sparkling Wine to add to Adventurous. The combination is sure to leave a lasting impression. The choice was great and my flowers were delivered in good time. Thankyou! My daughter was very impressed with her flowers. Thank you! So easy to choose and order and order delivered promptly. Which was all very good at this stressful time. Thank you so much. Ordering was easy, and flowers were delivered on time as promised!